What a promise! Do you want to experience God’s blessing? Then make His Word your delight as you allow it to nourish your soul each day! I somehow stumbled on www.davidhorner.org yesterday. David was the founding pastor of Providence Baptist Church in Raleigh, NC. I’m looking forward to learning more from him. His most recent post was this great song to start off the new year. Jesus thank you! Welcome to the New Testament Challenge! Have you actually ever read the New Testament? Most people haven’t. This is your big chance to read it through and learn more about your faith than ever before! Over the 9-weeks, beginning January 29th, you will have the opportunity to read through the New Testament in it’s entirety. Every day you will be reading several chapters from the New Testament (see the reading plan below). Then, on Sundays @ Friendship the teaching will connect to the readings that you during that week. Be sure to keep up with your reading and ask God to make Himself known to you during this challenge in new and fresh ways. If you do – God will change your life! So, strap in and join the entire Friendship Family on this spiritual adventure as we explore the New Testament together leading up to Easter 2018! I recently shared in one of my sermons at Friendship (new website in 2018, I promise!) about how I “kissed dating goodbye” and surrendered my relational status to God. Instead of dating, I began to employ a version of courtship to relationships in lieu of my failed attempts at honoring Christ through dating. As God often does, not too long after “surrendering” in that area of my life, I met and began the courtship process with my future bride, Courtney. A book that was especially helpful for me was called “Choosing God’s Best” by Don Raunikar. 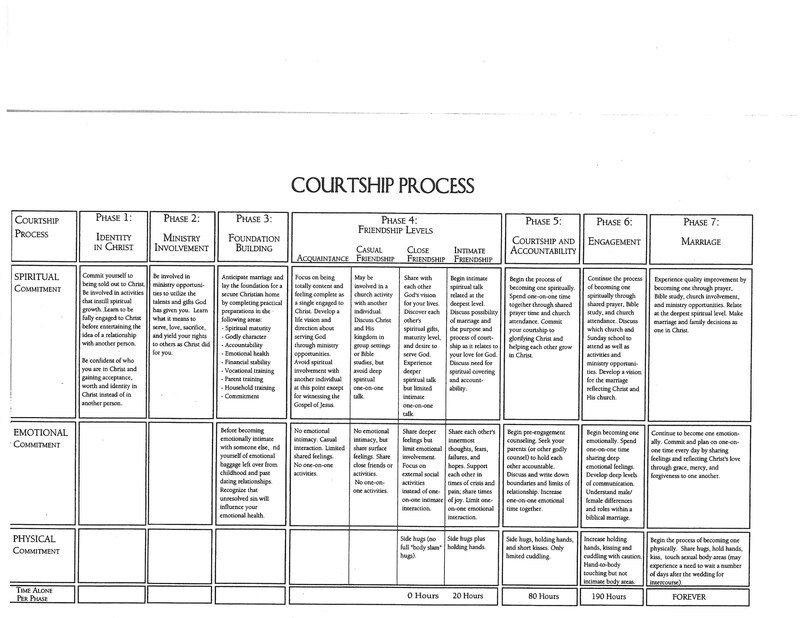 In his book, Raunikar offered this chart that gives a good summary of the process. You will certainly need to zoom in to be able to read it! Gene Getz has a great book about church leadership structure/governance called “Elders and Leaders: God’s Plan for Leading the Church.” In it he provides a chapter that includes some accountability questions he suggests for use with your church staff. Any men serious about true accountability would do well to use these questions as a guide. 1. How often did you meet with God this week? 2. What has God been saying to you through His Word this week? 3. What sins in your personal or business life did you experience this week that need confession? 4. Are you giving to the Lord’s work regularly and proportionately as God has blessed you? What percentage did you give last month? 5. What movies did you see this past week? Do you feel good about viewing these movies? What about the Internet? Would you be able to tell your fellow Christians in your church what you have seen without being embarrassed? 6. How did you influence your marriage and family this week? How positively? How negatively? What could you do to improve? 7. Did you pray for me/us this week? 8. What challenges or struggles are weighing on your mind? 9. What lives did you influence for Christ this week? 10. Did you just lie to me? Another analogy might be losing your cat who is your wife’s most precious possession, but that’s another story.